Stock is a simple to make ingredient that is great to keep on hand. You can use it in place of water when cooking things like rice, risotto, lentils, and beans for an extra boost of flavor. It is also a great way to use up extra vegetables you might have in the fridge. Below is the basic recipe that I use to make stock at home. When making stock for myself I usually like to start with a base of mirepoix. Mirepoix may seem like a strange word, but it is something you have probably cooked with before. A basic mirepoix is simply a combination of chopped celery, carrots, and onions. The ratio of these vegetables should be one part celery, one part carrots, and two parts onion. How much of this you need can be adjusted based on how much stock you are making and how much and what type of other vegetables you are using. The recipe below is really just an outline. In addition to the mirepoix, I also like to save vegetable scraps and leftover vegetables that I would otherwise not use. This can include herb stems, onion ends, kale and broccoli stems, mushroom stems, leek and scallion greens, tomato skins and seeds, and parsnip and carrot peels. Additional scraps that are great in stock include celeriac, chard, fennel, squash, peppers, and asparagus. I generally try to avoid overly starchy vegetables such as corn and potatoes. Also, try to avoid beets which will turn your stock purple. You can collect these extra vegetable scraps as you cook. Simply wash and rough chop them, then store them in a container in the freezer until you have collected enough to make your stock. 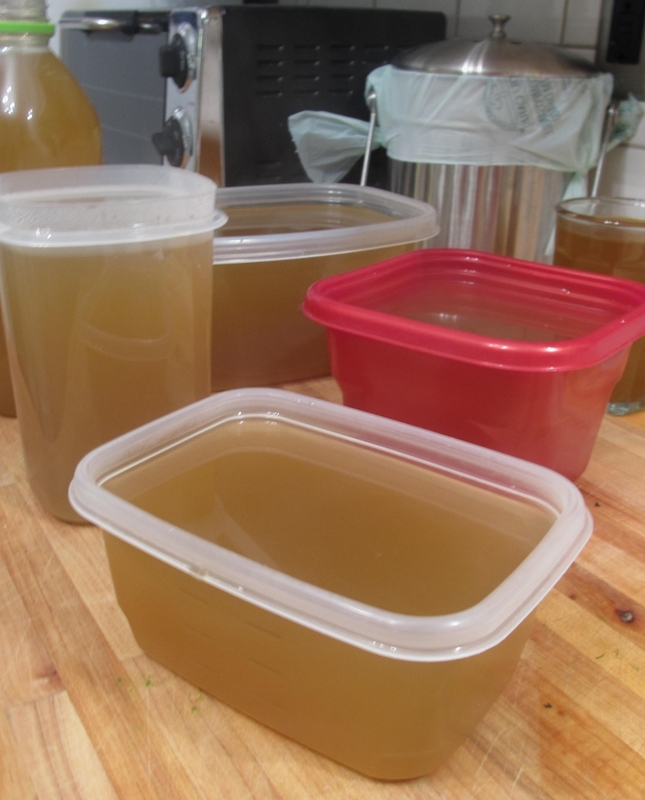 Once you have made the stock you can store what you don’t want to use right away in the freezer. I like to store mine in freezer proof jars. When you want to use the stock just pull it out and thaw it in the fridge 24 hours before you need it. 1. Chop the celery, carrots, and onions into approximately 1 inch size pieces. Some people suggest that you not include the skins of the onion as it can give your stock a yellow color. I, personally, am not concerned so much with the color and just throw it all in. What you decide to do is entirely up to you. 2. Put all the ingredients in a 4 quart pot. Fill the pot with enough water to just cover everything. 3. Cover and bring to a simmer over low heat. Allow to simmer for around one to two hours. Try to keep it at a low simmer, if your stock boils too hard it will get cloudy. Stir occasionally. 4. After one to two hours turn off the heat and allow to cool uncovered for a few minutes. 5. Pour the stock through a colander into another pot to remove the vegetables. Pour or ladle the stock into containers. Allow to cool completely, uncovered if possible. 6. Seal and store in the freezer until you are ready to use. Remember, making stock is not an exact science. Play around with it to see what you like, or just use what you have on hand. There is no specific right or wrong way to make it.